On the Big O Tires Facebook page wall, dated January 2011, reads a message posted by the Mooresville Chamber of Commerce that reads, “Thank you Big O Tires Mooresville for being our lunch sponsor for over 5 years!” For the past three years, at least, the Chamber monthly luncheons are attended by over 100 members, with caterers serving up hot meals at the Jones Crossing Banquet Center. 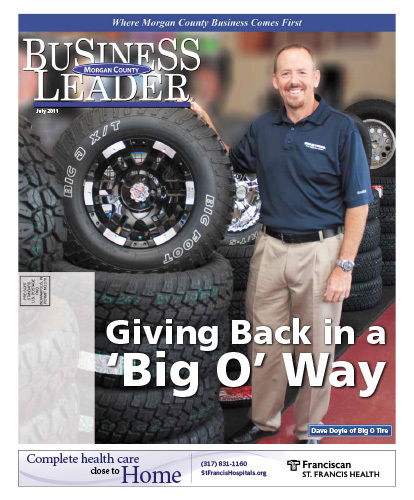 Thanks to the efforts of Dave Doyle, owner of Big O Tires in Mooresville and Plainfield, Chamber members and guests out-of-pocket contributions have held steady at $5 per person for several years. After a few months, the dozen or so members had blossomed to around 30. “At that point, my wife invested in some serving bowls, pans—everything to cater to a small group, and we’d cook the day before. So we were serving everyone for a few months. Then it grew to where we needed two days to prepare.” As the Chamber growth spurt continued, Dave made a tough decision. “I said, I can’t do this all myself, but if everyone can contribute $5, I’d pick up the balance to bring someone in to cater it.” Dave’s role in the Chamber continues to grow. He now provides the monthly Chamber reminder notices and has turned them into an opportunity to contribute to local not-for-profit organizations. Download the full July 2011 Edition here.